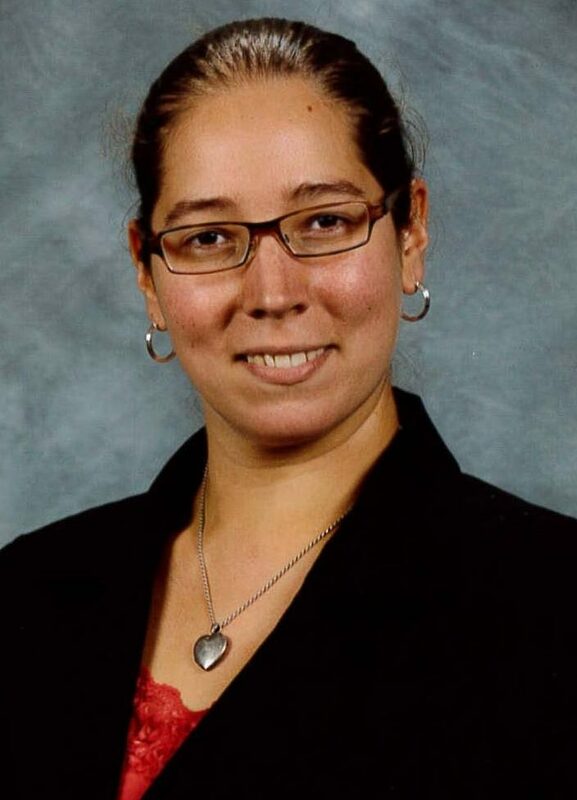 Jennifer Loudon, a Water Environment Federation (WEF; Alexandria, Va.) member since 2005, is the laboratory manager at the Raritan Township Municipal Utilities Authority (Flemington, N.J.). She is an environmental scientist with experience in wet chemistry, microbiology, molecular biology, ecotoxicology, marine biology, and protein biochemistry. Loudon also is an environmental engineering doctoral student at Stevens Institute of Technology (Hoboken, N.J.). 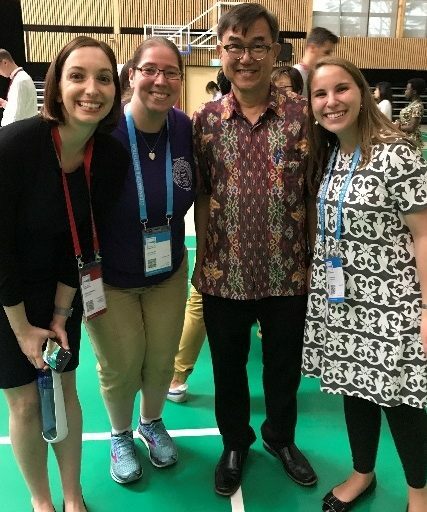 In addition to being WEF Laboratory Practices Committee chair, she is an active member of the WEF Students and Young Professionals Committee. One of the words most often heard in the laboratory of a wastewater utility is “standard” — standard methods, a standard reagent curve, Internationals Organization for Standardization, just to name a few. But there’s another “S” word that needs recognition: sustainability. In June, 1000 students and young professionals gathered at National University of Singapore to discuss sustainability at an event known as the UNLEASH Innovation Lab. I was extremely humbled to be among the lucky chosen participants. The 2018 UNLEASH cohort chosen for the program spent an amazing 8 days in Singapore learning the UNLEASH innovation process and making lifelong global connections. In 2015, the United Nations General Assembly adopted 17 sustainable development goals (SDGs) as part of its 2030 Development Agenda. Each SDG has a few associated action items, or targets. The agenda consists of 169 targets aiming to make the world a better place by 2030. One of the most important aspects of the SDGs is that they are designed to “leave no one behind;” that is, they should be achieved by all member states regardless of their economic, social, or environmental positions. As you can imagine, this is quite a lofty mission. Achieving true sustainability implies both environmental and financial responsibility. For example, developing a wastewater treatment application with a circular economic model builds long-term resilience, generates business opportunities, and provides environmental and societal benefits. Jennifer Loudon, middle, works with her team to come up with a solution to providing clean water and sanitation to communities in need during the 2018 UNLEASH Innovation Lab. Photo courtesy of Loudon. A global initiative was formed to help start working on accomplishing this mission. UNLEASH Innovation Lab was introduced in 2017 to accelerate next generation ideas and partner the selected students and young professionals from around the world with companies, nongovernmental organizations, government agencies, investors, and foundations that are at the forefront of innovation and global development. Even in a nation as advanced as the U.S., we still must work on all these targets. Out of 1000 participants, 83 chose to examine this goal. We were broken into teams that received guidance from technical experts and process facilitators. UNLEASH participants meet Jack Sim (third from left), the founder of the World Toilet Organization (Singapore) and World Toilet Day. From left, the WEF participants pictured are Kristen Waksman, Loudon, and Diana Prado. Photo courtesy of Loudon. 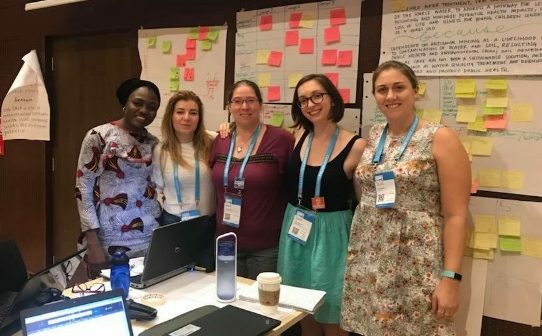 I was part of a team of five women from four countries: Australia, Albania, Nigeria, and the United States; we were the only all-female team focused on SDG 6. The team decided to address the environmental effects of artisanal mining. Mining facilities that do not have formal owners do not have mandatory safety and environmental regulations for operation. This leads to public health and ecological problems that can include causing the death of children who ingest lead-contaminated water. The more we explored the problem, the more we realized its enormity and complexity, both environmentally and socially. We established that, while we could not fix many associated issues, we could take a small step toward helping by installing household-based water treatment systems. These systems would use sand filtration and adsorption to remove lead and improve the overall quality of potable water. One key component of our solution was making sure the filtration unit could be made of materials easily found locally, such as homemade charcoal or coconut husks to act as adsorption media and 208-L (55-gal) barrels to provide water storage. We also submitted plans for distributing educational materials to locals. These materials would explain small steps that can be taken to make living near mining practices safer, such as by wearing personal protective equipment to avoid ingesting contaminated dust, as well as the care and maintenance of filtration and water storage units. 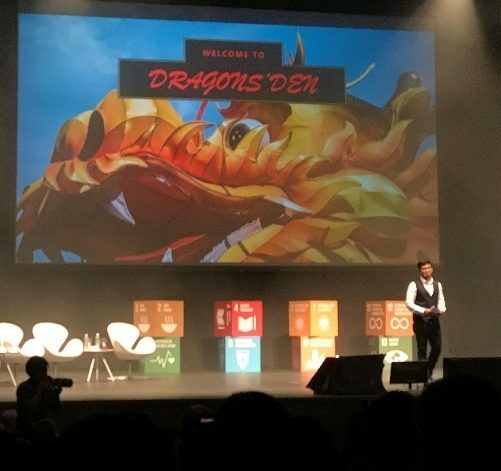 The two highest-scoring teams for each Sustainable Development Goal pitched their idea to everyone at the Dragons’ Den ceremony. Photo courtesy of Loudon. After four, 20-hour days of “innovating,” we pitched our ideas to a panel of judges representing academia and the private sector. We also had the opportunity to meet members of the public and potential investors during a marketplace event held alongside Ecosperity, an annual sustainability conference hosted by Temasek (Singapore). The two highest-scoring teams for each SDG pitched their idea to everyone at a ceremony called Dragons’ Den. A panel of “dragons,” similar to the “sharks” on the television show Shark Tank, chose a winner for each SDG. One of the best things about this innovation-stimulating program is that even if your team is not chosen as the best in your SDG, every team contributes to a published “Solutions Catalogue” that is distributed to potential investors around the world. You also develop strong bonds with other talented individuals, and the problems are so important, that the closing ceremony does not have to be the end of your effort. Advancing sustainability is a lifelong mission to which everyone can contribute. UNLEASH is made possible by numerous partners including DBS Bank (Singapore), Temasek (Singapore), Deloitte (New York), Microsoft (Redmond, Wash.), Devex (Washington, D.C.), LEGO (Billund, Denmark), the Carlsberg Foundation (Copenhagen, Denmark), Dalberg (Washington, D.C.), and the United Nations Development Programme (New York). I am glad these organizations contribute to host this important event. I also am grateful to the New Jersey Water Environment Association and Water Environment Federation (WEF; Alexandria, Va.) for making my attendance and participation possible.